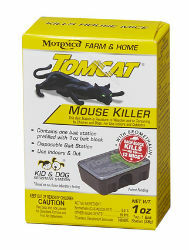 Tomcat Mouse Killer is a Disposable Bait Station made with a highly durable polycarbonate. Effectively controls mice while providing the security of a Tier 1 child and dog resistant station. Convenient disposable station - simply discard when bait is gone. Clear lid for easy bait monitoring. Made with Bromethalin – an acute, non-anticoagulant active proven to kill mice faster than anticoagulant baits. Each Block kills up to 12 Mice, based on no choice laboratory testing. Available in 1 pack, 2 packs, and 4 packs.